[FIXED] In Product Type - Parameter Unit value is not shown on frontpage. Product type -> Product Parameters -> Parameter Unit value is not shown on frontpage. 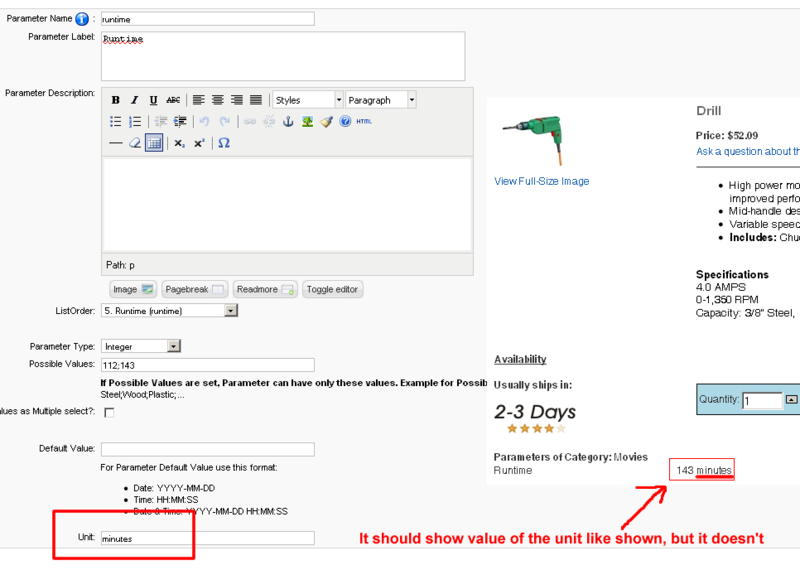 Re: In Product Type - Parameter Unit value is not shown on frontpage. I will have a look at SVN changes between 1.1.3 and 1.1.4, so maybe we can quickly find the issue. I'm also experiencing this problem on (VM 1.1.5). It would be great if you could fix this issue as soon as possible. It's quite important in my opinion. Although I'm not coding expert, I took a quick look at the code comparing VM 1.1.4 and VM 1.1.3 and it seems the problem lies in file administrator/components/com_virtuemart/classes/ps_product_type.php. There are big changes in function list_product_type($product_id). Re: [FIXED] In Product Type - Parameter Unit value is not shown on frontpage. Hello Everyone! I am Aden miller. I didn't understand this post "Although I'm not coding expert, I took a quick look at the code comparing VM 1.1.4 and VM 1.1.3 and it seems the problem lies in file administrator/components/com_virtuemart/classes/ps_product_type.php." Anyone here who tell me about this.... ? ?